2017 Rittenhouse Buffy the Vampire Slayer Ultimate Collectors Set Series 2 features autographs from the show’s two biggest — and toughest — signatures. Each factory set, which carries a suggested price of $399.99, comes with one of three signed cards, a set of Season Montage cards and one Metal card. Despite producing more than a dozen sets for Buffy, Inkworks never managed to get a Sarah Michelle Gellar autograph. Rittenhouse not only did it with their first Ultimate Collector’s Set in 2015 but they’ve done it again here with an autographed costume card of the actress. Joining Gellar is Alyson Hannigan who played Buffy’s best friend, Willow. The actress, who also had major roles in American Pie and How I Met Your Mother, has a pair of autographs here. Hannigan’s only other autograph card came in the show’s debut release, 1998 Inkworks Buffy the Vampire Slayer Season 1. Today, it’s a tough card to track down and prices reflect that. Every 2017 Rittenhouse Buffy the Vampire Slayer Ultimate Collectors Set Series 2 factory set has either the Sarah Michelle Gellar autographed costume card, a full-bleed Alyson Hannigan autograph or bordered Hannigan autograph. Because all three cards were not produced in equal numbers, there’s no guarantee collectors will get one of each card for ordering a trio of sets. However, those ordering five sets will get one of each of the Hannigan cards along with three costume cards. That makes the Willow cards significantly tougher. That said, will Rittenhouse mentioning a print run of 600 total sets, none of the three have very many copies. 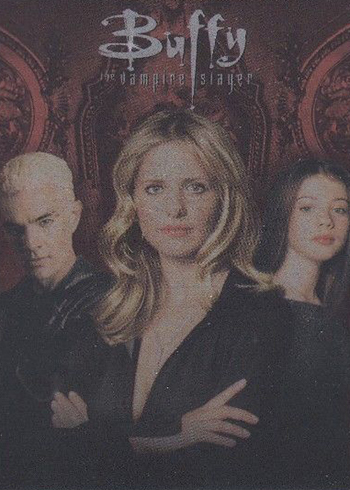 The one-per-set Metal cards highlight the show’s top characters: Buffy, Willow, Xander, Giles and Spike. Those ordering five sets from Rittenhouse not only get one of each but a bonus second set as well. If there’s a base set to 2017 Rittenhouse Buffy the Vampire Slayer Ultimate Collectors Set Series 2, this is it. All seven cards come with each set. Those who own the Buffy DVDs might recognize the artwork from the covers. Like the first set, Sketch Cards are an incentive. These were wildly popular before, in part because they were the first such cards for the franchise. The quality was also very strong, which appears to be the case once again. 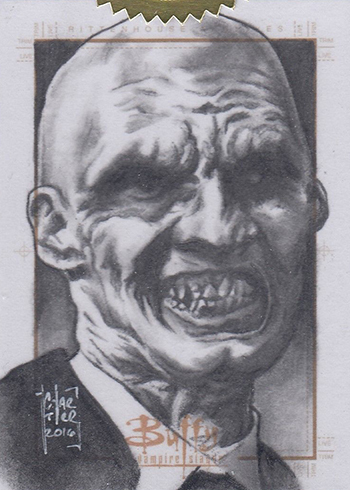 Sketch Cards come as a five-set incentive. 2 cards. 1 total signed card per set. 1 card. 1 total signed card per set. 5 cards. 1 per set with a bonus set for 5 sets ordered. 7 cards. All 7 per set. 14 artists. 1 per 5 sets ordered. Is Buffy the Empire Slayer next? 600 cards. 3 out of 5 are Buffy. So 360 Buffy and approximately 120 for each of the Willow cards. Collectors will likely have to buy 5 sets to get what they want and sell the excess Buffy autos and metal set to recover some of their money. I’d guess a “master” basic set for a collector might be doable for under $1000 provided they are patient on selling the Buffy autos and they can live without making a set of sketches. Collecting comes at a price way beyond my wallet. Started to see these online. People are breaking out the autos and asking the price of the full set or more. So, they make a profit on the other cards, which I guess is reasonable since people get the cards they want.